I was concerned that many of the teachers in the room considered my honest response regarding student talent as harsh or too American. 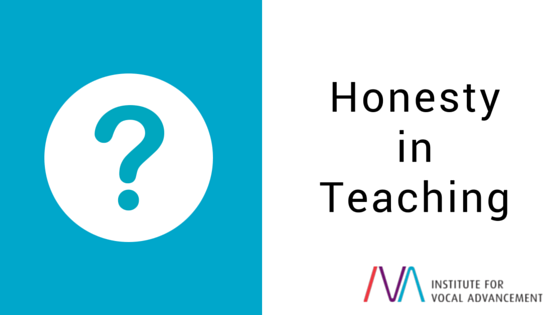 Honesty in voice teaching is directly proportional to two different variables: (1) age and (2) the student’s capacity to see themselves as an outsider would see them. Age is the biggie for me. I’d never tell a twelve-year-old that they really didn’t have the talent to justify the expense and commitment required for them to ever sing professionally; however, I would have a conversation with the parents of young teenagers, away from the student, where I would be forthright and truthful. Conversely, I’d never fail to communicate with anyone over 18 to 20 years of age the realities of their aspirations—in spite of their willingness to work hard. At some point, one or both of us will look foolish and be embarrassed. While we want to be supportive and encouraging to our students, we must be careful not to give a false sense of their natural capabilities. The real question that must be addressed is how to determine if there is innate talent in a young student. What is the criteria we look for in determining the potential of these young pupils? This is an incredibly complicated question, and it is clearly full of objectivity traps. Pitch, tone, musicality, and confidence immediately come to mind as we consider just how much talent a young singer has and what their potential is. But it takes years of ear development for a new teacher to see and understand potential in a new student. professional dancer or athlete. Likewise, we would make allowances for voice students whose commitment may be less than our expectations. As a final thought, remember that each of your students will leave you at some point. They will leave because of scheduling conflicts, boredom, increased awareness of their lack of talent, or parents becoming less willing to commit financially to an activity that is costly and hugely long-term in nature. These particular students must, at some point, transition from children to young adults. As they mature physically, emotionally, and vocally, they will be increasingly prepared to accept the realities of their path. Honesty—-doled out in age-appropriate fashion—will only help students as they continue to grow. But honesty has many levels. I often suggest to young teachers to consider themselves as parents of the young student; this will help them understand that we don’t give ALL available information to a child. A parent knows when a child is ready for complete honesty.